I love the Strawberry Festival. Held over the Memorial Day weekend, my husband always rushes to be done with spring planting to attend this annual event. We come for the tractors, the art and of course the food. I personally am always on the lookout for jewelry and this year Keith caved to my request of a beautiful spoon necklace made by Betty and Gary Pingelton. Their jewelry was a form of repurposing using spoons works perfectly with their name, Recollection Heirlooms. But I divert, the big surprise at this was the number of writers onsite. I have set up at the event before with my books but always seem to get rained out. This year was the perfect year to be a writer and be set up at the show. The array of writers and books offered would please anyone who loves to read and this was a great opportunity for any librarian seeking to set up signings, talks and get signed copies. 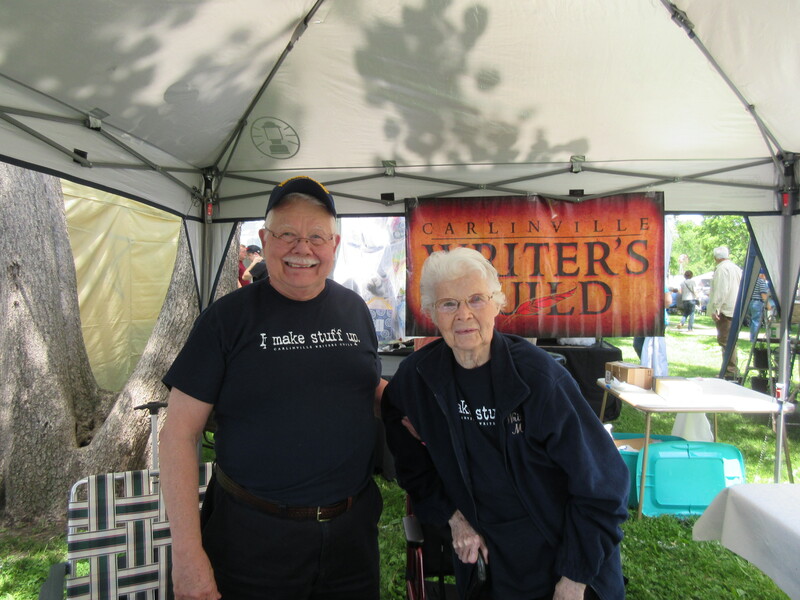 Several members of the Carlinville Writing Group including John Smith from Highland were set up at the show. John and his mother(in the picture below) were manning the booth and John had his book Dark Dreams available. Writer Carolyn E. Brown had Laughter is Medicine and Sandra Kohler Kohlbrecher had Graffitti Bride, New Haden and her anthology available to name a few of the members of the group. Writer D. I. Dennis had a historic novel The Witwer Files based in a small Midwestern village. The story is about actual events and based on his grandfather. D. L. also holds workshops for writers on how to publish their works. A schedule of events can be found on http://www.thewitwerfiles.com/book-signings-and-events.php. Children’s writer Letty Crays had her Timmy the Turtle book series as well. I feel badly that I missed the name of a new writer who had delightful stuffed animals she had created and she had a book if I recall called Alligator Toes that looked to be quite fun. So in retrospect, this year, the Strawberry Festival was a literary event. Perhaps I should have dressed nicer and brought tea! Yes, you can find me on Cindy Ladage@cindyladage on twitter, I look forward to your follows!